The method of brevity has been used as a rhetorical narrative strategy since the Antiquity. Brevity method can also be detected in many Medieval European historical narratives as an instrument of presenting the narrative to the audience functionally and expressing the didactic and moral message properly. Brevity method in medieval narratives was very helpful for the historians in order to communicate truth very lucidly by influencing, convincing and entertaining the reader. The purpose of this study is to examine the question of brevity in the narratives through the analysis of the examples from medieval chronicles. This subject is quite important but has been neglected by many historians. The main question to be asked in this paper is: why did the medieval chroniclers give utmost importance to the question of brevis in their works? In other words, why did the chroniclers underline the use of brevis in narration process? By examining these questions, this paper will hopefully display that the medieval chroniclers were considering the concerns of their readers even though we mention relatively limited audience. Additionally, this study will show how the medieval chroniclers as historians aimed at representing truth very clearly on the plane of historical reality and attempted to encourage their readers to think by reading and enjoying the text. Tarihsel anlatıların işlevsel biçimde okuyucuya sunulması ve verilmek istenen öğretici ve ahlaki mesajın yerli yerince ifade edilebilmesi amacıyla retoriksel bir anlatı stratejisi olarak antik dönemden beri kullanılan kısalık yöntemi Ortaçağ Avrupa’sında yazılan tarih metinlerinin birçoğunda görülebilir. Okuyucuyu etkilemek, anlaşılır bir dille ikna edebilmek ve eğlendirmek gibi amaçları taşıyan anlatıda kısalık yöntemi hakikatin öz biçimde verilebilmesinin de etkin bir yolu olarak görülmüştür. Bu çalışmada, Ortaçağ Avrupa tarihçiliğinde ihmal edilen anlatıda kısalık konusu bir anlatı türü olan Ortaçağ Avrupa kroniklerinden örneklerle tartışılacaktır. Ortaçağ tarihçileri anlatıda brevis yani kısalık/özlük sorununa neden önem vermişlerdir? Bir başka deyişle, farklı tarihçilerin eserlerinde anlatının kısa olması gerektiği vurgusu niye bu kadar öne çıkmıştır? Bu sorular etrafında yapılacak tartışma, Ortaçağ tarihçilerinin kısalık/özlük ilkesine dayanarak okuyucu kitlesini, her ne kadar sınırlı bir kitleden bahsediyorsak da, dikkate aldıklarını, bu ilke aracılığıyla geçmişte yaşanılan hakikati tarihsel gerçeklik alanında anlaşılır biçimde sunmayı hedeflediklerini ve sıkıcı olacakları kaygısıyla okuyucuyu hem keyif alarak okumaya hem de düşünmeye sevk etmek istediklerini ortaya koyacaktır. Beer, J.M.A. (1981). Narrative conventions of truth in the Middle Ages. Géneve: Librairie Droz S.A.
Coulton, C.G. (2013). Social life in Britain from the conquest to the reformation. London: Routledge. Curtius, E.R. (2013). European Literature and the Latin Middle Ages, with a new introduction by Colin Burrow. Princeton: Princeton University. George, C.W. ve Wright, W.A. (1866). The works of William Shakespeare: Vol VIII. London: MacMillan. Goldstein, L. (2013). Introduction. L. Goldstein (Eds. ), Brevity (s. 1-17). Oxford: Oxford University. Gransden, A. (1992). Prologues in the historiography of twelfth-century England. A. Gransden. Legends, Traditions and History in Medieval England, (s. 125-151). London: The Hambledonı. Gransden, A. (1982). Historical writing in England II: c. 1307 to the early sixteenth century. London: Routledge & Kegan Paul. Kempshall, M. (2011). Rhetoric and the writing of history. Manchester: Manchester University. Lake, J. (Ed.). (2013). Prologues to ancient and medieval history: A reader. Ontario: University of Toronto. Partner, N.F. (1977). Serious entertainments: The writing of history in twelfth-century England. Chicago: University of Chicago. Pascal B. (1847). The provincial letters. (çev.). T. M’Crie. Edinburgh: J. Johnstone. Ryding, W.W. (1971). Structure in medieval narrative. The Hague: De Gruyter. Speake, J. (Ed.). (2015). Oxford dictionary of proverbs. Oxford: Oxford University. Spence, J. (2013). Reimaging history in Anglo-Norman prose chronicles. Woodbridge: York Medieval. Spiegel, G. (1999). The past as text: The theory and practice of medieval historiography. Baltimore: The Johns Hopkins University. The Chronicles of Enguerrand de Monstrelet, Vol: 1. (çev.) T. Johnes, ESQ. (1867). London: Geroge Routledge and His Sons. The Etymologies of Isidore of Seville. (çev.) S. A. Barney, W.J. Lewis, J.A. Beach, ve O. Berghof. (2006). Cambridge: Cambridge University. White, H. (1990). The content of the form: Narrative discourse and historical representation. Baltimore: The Johns Hopkins University. White, H. (1973). The historical ımagination in nineteenth-century Europe. Baltimore: The Johns Hopkins University. Wood, J. (2012). The politics of ıdentity in Visigothic Spain: Religion and power in the histories of Isidore of Seville. Leiden: Brill. Woolf, D. (2012). Tarihin küresel tarihi. M. Moralı (Çev.). İstanbul: Alfa. ISNAD DURGUN, Fatih . "“KISALIK BİLGELİĞİN RUHUDUR”: ORTAÇAĞ TARİH ANLATILARINDA KISALIK YÖNTEMİ". 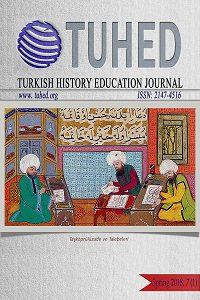 Turkish History Education Journal 7 / 2 (October 2018): 618-631.